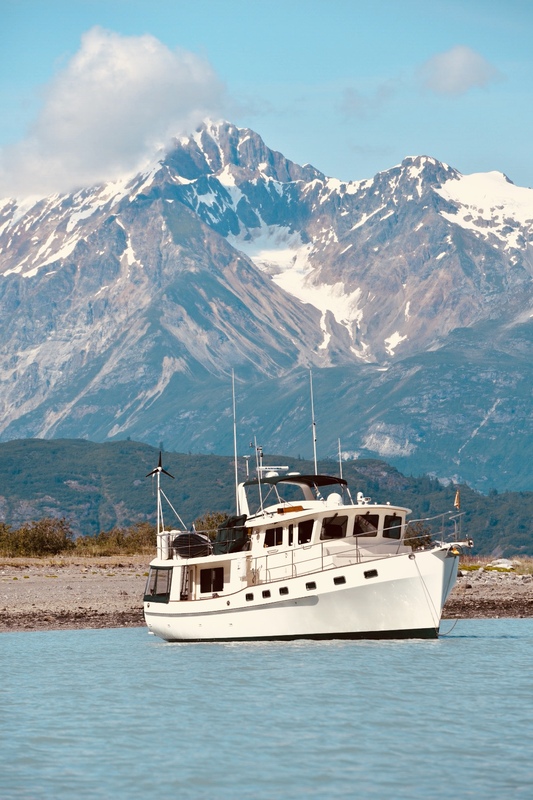 With a favorable forecast for the Strait of Georgia, we reluctantly say goodbye to Rekindle and Navigator and depart Van Donnop anchorage at first light for a 62 mile run down the strait to our anchorage in Tribune Bay on Hornby Island. Seeing several whale spouts, we make a stop to see what is going on. 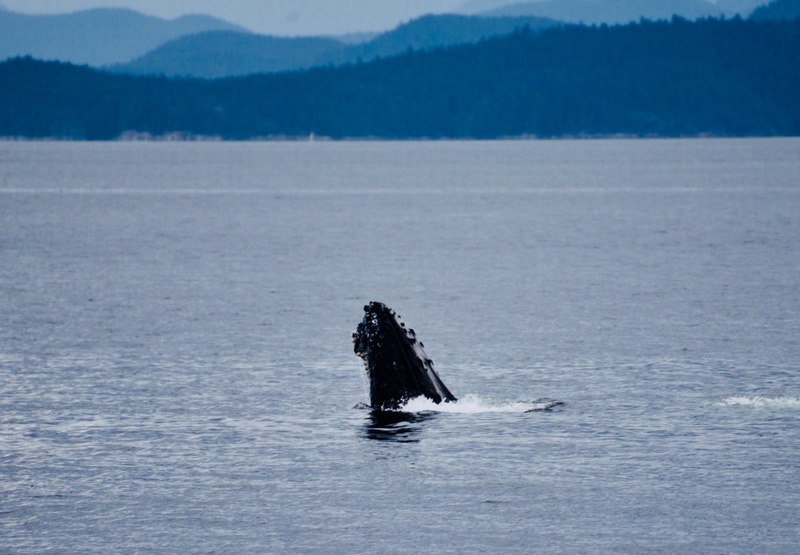 We are entertained for the next half hour as we watched several humpbacks feeding. Nanaimo is our next destination. 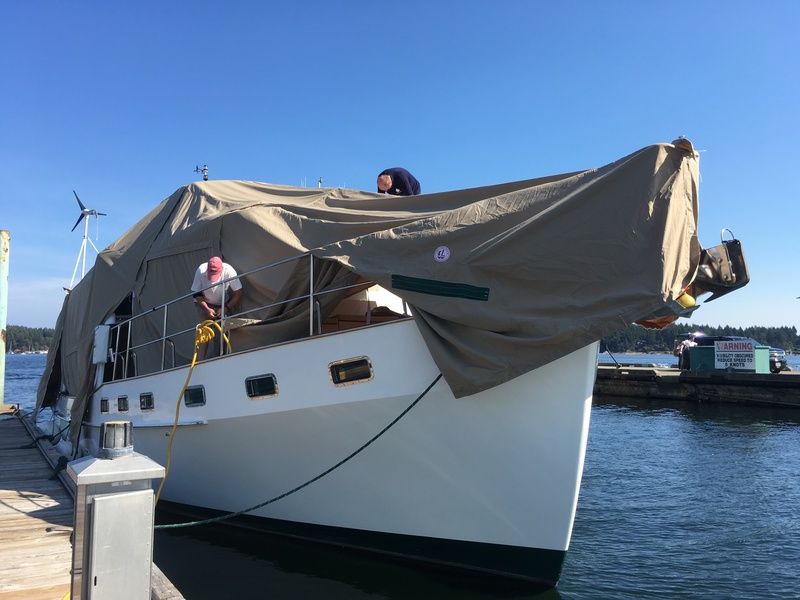 This spring we contracted with Lohmann Covers to make a whole boat cover for Idyll Time. During the winter season, the PNW gets lots of rain and wind. Over the years, Idyll Time has been kept in a boat house where she has stayed warm, dry, and clean. Shrink-wrapping is an expensive alternative and we feel it is environmentally unsound. Chris Lohmann has been making boat covers for over thirty years. With over 3300 covers, he has this technique perfected. 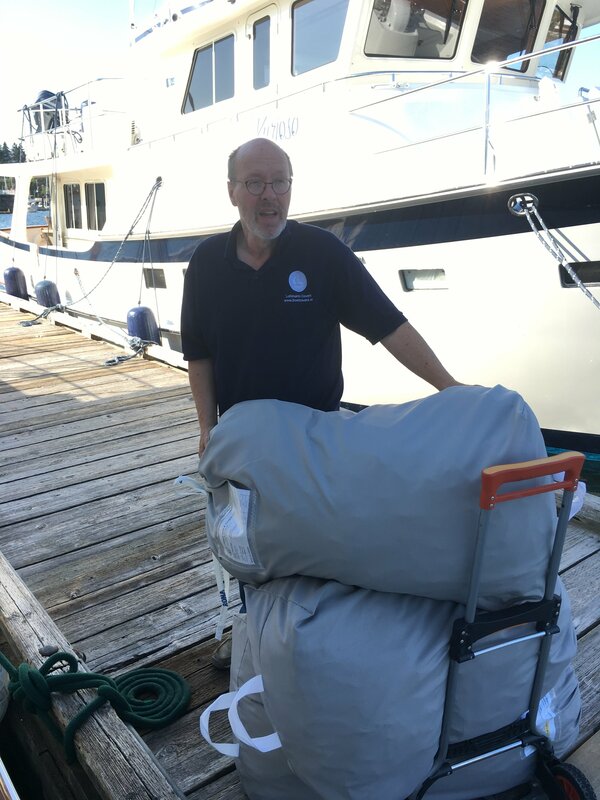 Chris delivers our cover to Nanaimo and spends three hours with us fitting our new cover over the boat and giving us instructions on how to install. The cover came in four big bags. Each of these bags contains one section and they all zip together to form the shell. The light weight Dacron sail cloth material makes each section easy to handle and it fit like a glove. A dozen steel snow poles provide the necessary tension on the top sections to keep snow and ice from accumulating. 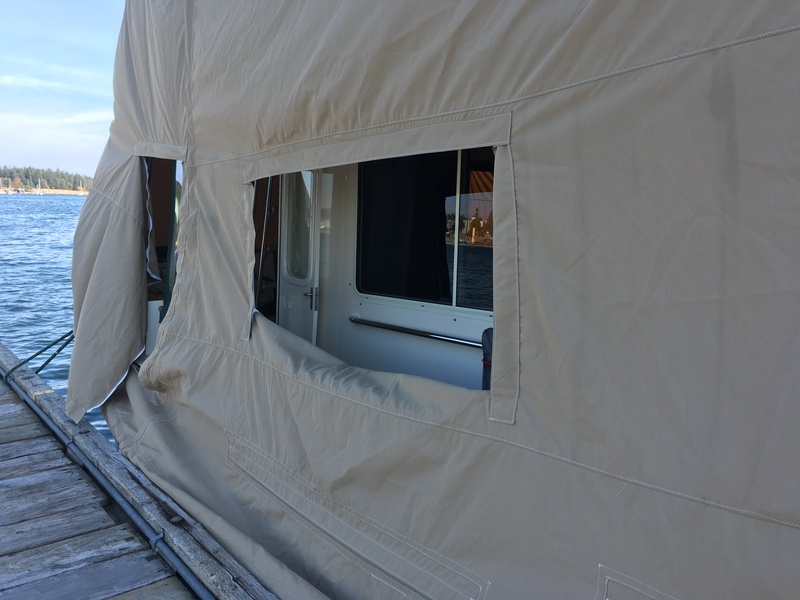 Over 40 tension straps keep the sides snug to the hull and a giant drawstring waistband gathers at the stern to keep the cover nice and tight along the waterline. He even incorporated side windows, access doors, and slots for lines and fenders. This should keep Idyll Time warm and dry this winter. Several people have asked about Nate and Primo, our two Amazon parrots. Over the years, we have written about our trials and tribulations of moving between borders with the birds. 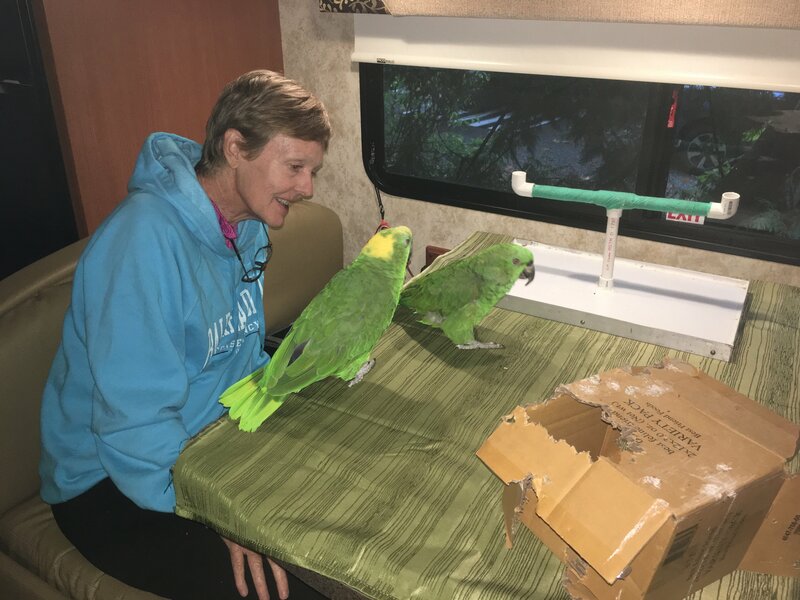 Because of these difficulties in crossing the US/Canada border with them, they stayed at “ Bird Camp” here in Nanaimo for the summer at the “Too Crazy Birdie Hotel” run by Dianna and Kip Slater. We are eager to visit with them while here in Nanaimo. Having been gone for almost three months, we were wondering if they would even remember us. They did, and were very excited to see us. Nate even tumbled off his cage when he saw us through the window as we entered the front yard. After several hours visit, it was hard to leave them once again but we look forward to picking them up in a few weeks once we get the boat back to the U.S. It is much easier to cross the boarder with them in the RV than by water. From Nanaimo, we make a 21 mile east bound passage across the Strait of Georgia to British Columbia’s largest city, Vancouver. As we approach the city waterfront, our AIS lights up with targets. Most of these are huge ocean going ships at anchor in the outer harbor waiting their turn to enter the main harbor for loading or unloading their cargo. 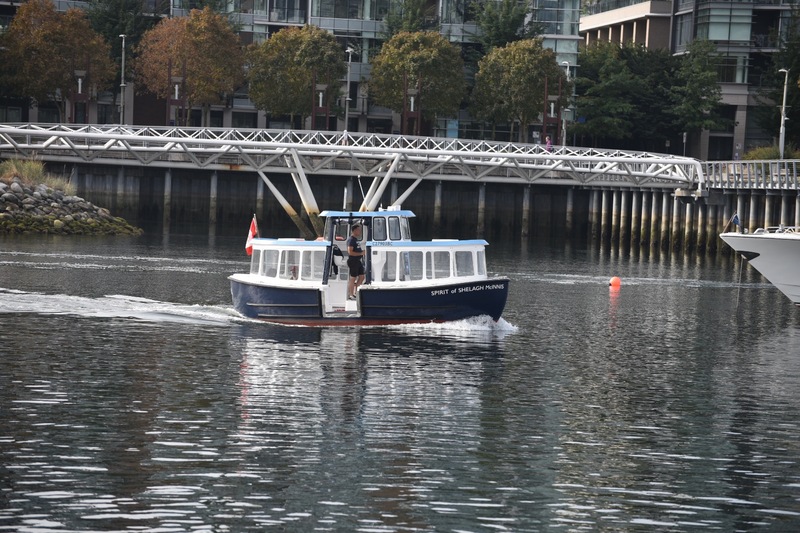 We head into False Creek, a busy waterway lined with numerous marinas and boats at anchor. 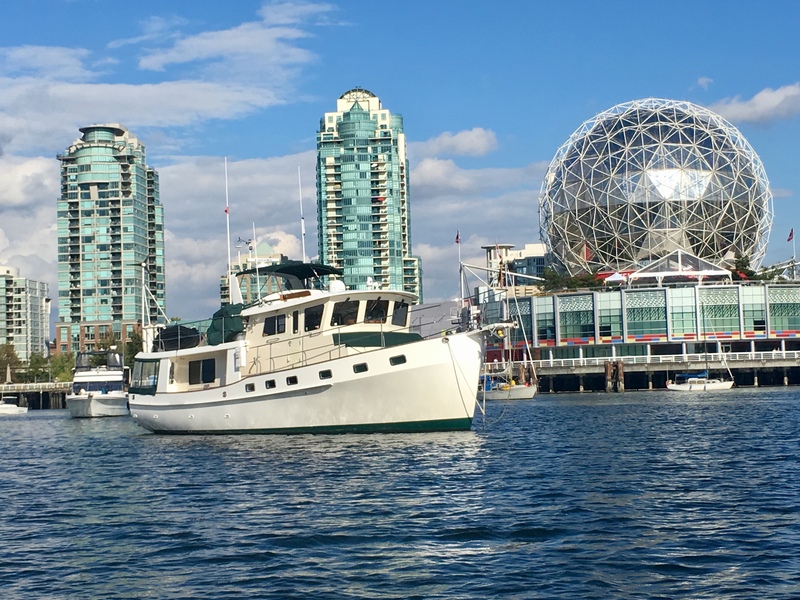 We travel to the head of the harbor dodging the many water taxis and other boat traffic where we find a great spot to anchor in the heart of Vancouver’s Olympic Village neighborhood. It is quite the contrast to where we were just a few months ago in Glacier Bay. We had applied online for an anchoring permit the previous week. Boaters are only allowed to anchor here for 14 days per year. 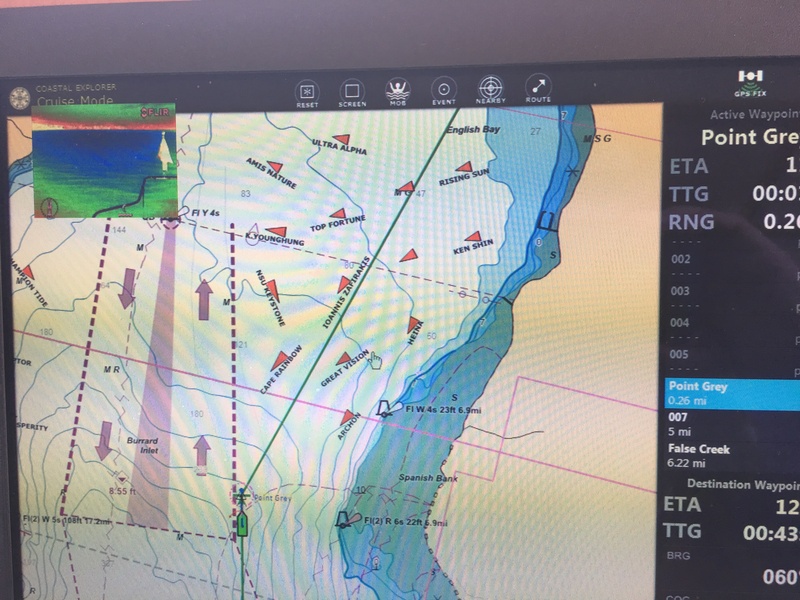 This system was recently implemented to prevent boaters from living here permanently on their boat . We spend the next five days enjoying and exploring the vibrant city. The bike paths crisscrossing the entire city are well marked and maintained. Visits to Stanley Park, Chinatown, the Granville Market, and a food tour of Gastown are a few of the highlights that kept us constantly on the go. It is a beautiful city and will be sure to return in future years. With the Krogen Rendezvous starting in a few days, we travel a short 12 miles into Howe Sound to Union Steamship Marina on Bowen Island. Although a short trip, this was some of the worst seas we have encountered in a long time. At Point Atkinson, we suddenly find ourselves battening six foot seas on a three second period. We aren’t sure exactly what happened but the tide must have been against the inflow/outflow winds that come from the surrounding mountains. The Krogen Rendezvous is a hugh success with over 40 boats and 100 participants. 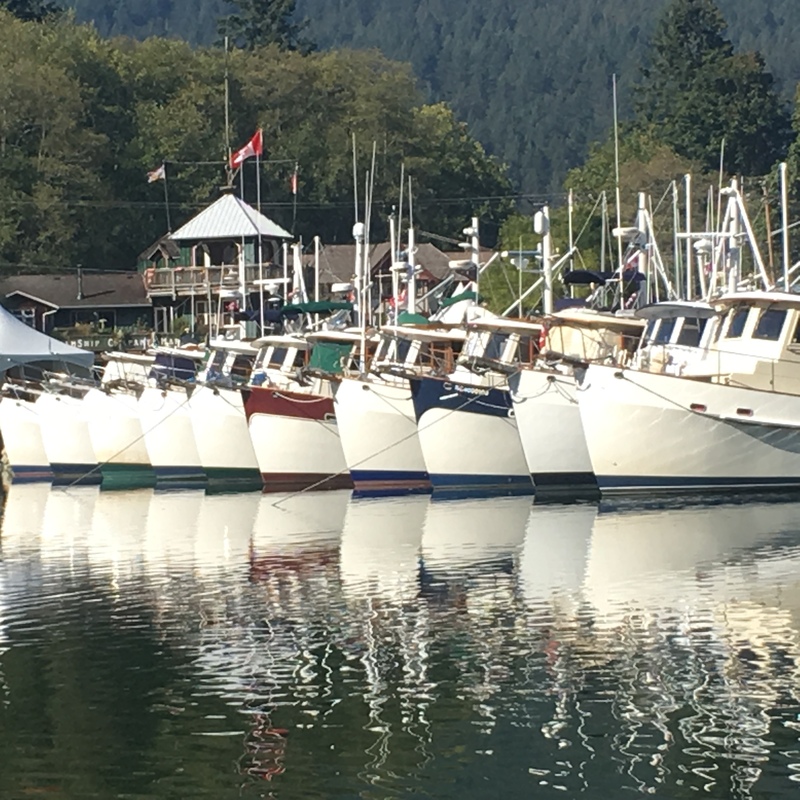 This was the largest west coast Rendezvous to date and Union Steamship Marina did a great job of getting all the boats safely rafted together without a scratch. We enjoy the next four days attending seminars and visiting with friends new and old. With the end of the 2018 cruising season rapidly approaching, it is time to point our bow south towards Anacortes, WA for end of season maintenance chores and haul out of Idyll Time. This entry was posted on October 10, 2018 at 12:31 pm. You can follow any responses to this entry through the RSS 2.0 feed. You can leave a response, or trackback from your own site.